Submerge your whole body up to your chin for the most benefits. Take before bed-makes you tired. Take 1- 2x a week or more once your body adjusts. *Do not stay in this bath for more than 40 minutes. I once stayed in for about an hour and became very sick after with sinus infection, sore throat, fever etc that lasted between 24-48 hours. My read on this is that too many toxins were brought to the surface and it was too much for my body to handle. 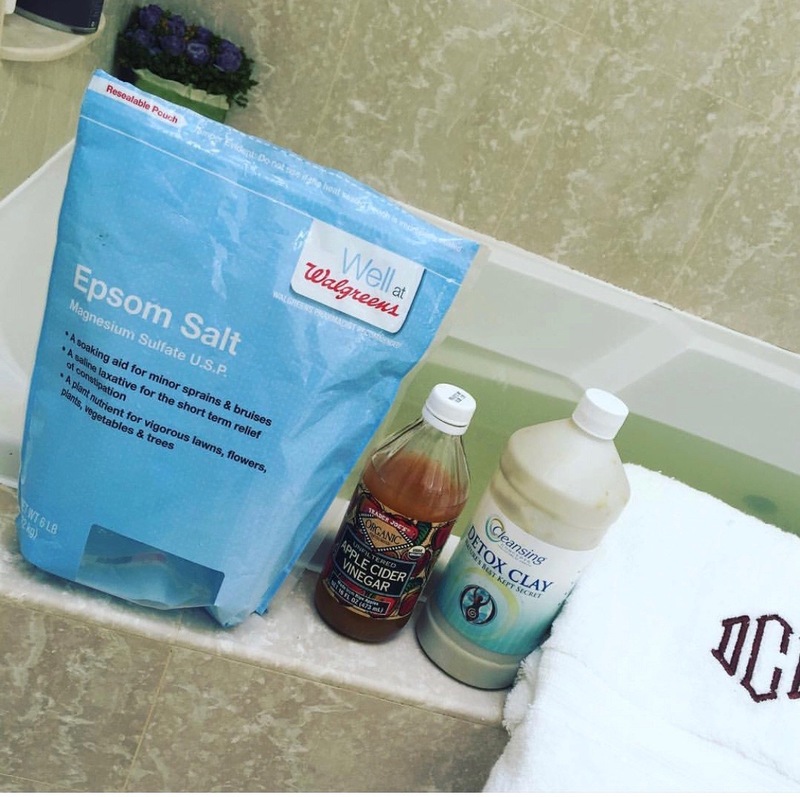 Epsom Salt relieves pain and muscle cramps. It is great for detoxification and also good for after a hard workout. Epsom salt helps to detoxify your body by making you sweat out toxins. Also, you will absorb some of the minerals and trace minerals found in the salt such as magnesium. Bentonite clay external benefits include: detoxify heavy metals stored in body tissue, acne, aching joints, sprains and strained muscles, relieve symptoms of Herpes 1 & 2, Eczema, Psoriasis, skin rashes, heals cuts and bruises, pulls out infection from a wound or sore and more. Do not use metal with Bentonite Clay because it makes the clay less effective. Apple Cider Vinegar provides relief for those with joint problems, arthritis and tendonitis. It also is very helpful for excessive body odor. ACV can naturally help kill fungus and bacteria on the skin. It provides relief for skin problems like eczema, dandruff, dry skin and acne. ACV can also help with UTIs by helping to kill off the yeast or fungus. I like Bragg Organic Apple Cider Vinegar. FYI-the Crystal Bath Ball you have to move around in the tub for 5-8 minutes before bathing. If you are someone that is pressed for time, the Vitamin C might be a better option. Using Bentonite Clay in the bath. Upon contact with fluid, its electrical components change, giving it the ability to absorb toxins. Bentonite is known for its ability to absorb and remove toxins, heavy metals, impurities, and chemicals. -Consider using a dry skin brush before taking bath for added benefits. -My first 20 baths or so were very draining on my body but as my body adjusted, the baths have gotten less draining and I added a little more Epsom salt (about 1/4 of a cup) to get the same effect I had gotten previously.